Dương Ngọc Cảnh, Poster, 1966; recreated by Trần Thị Vân, 2016. Roki paper and colored powder, as per the original. “Defend our native land, defend our youth.” This message speaks volumes regarding female involvement in the Vietnam War. 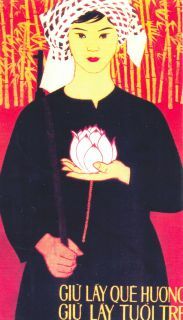 In this piece of propaganda released by the National Liberation Front (NLF), a woman is depicted holding a lotus flower in one hand with a gun slung across her opposite shoulder. Such imagery suggests that the women engaging in the Vietnam War were multifaceted: not only could they maintain the purity and dignified grace of the lotus, but also bear arms on behalf of their nation. Such skill sets demonstrated by Vietnamese women have long played a role in warding off foreign invaders predating French imperialism. It is well documented from 1945-1975 that women hailing from diverse backgrounds stood alongside male soldiers to work with the NLF. Daughters, wives, aunts, mothers in the hundreds of thousands indiscriminately took up arms and headed to the front lines. Vietnam’s relationship with communism further aided the erasure of traditional gender stereotypes. 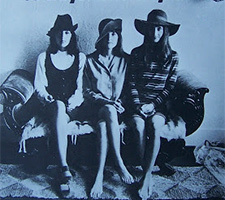 The propagation of said stereotypes in Western culture ultimately acted to the NLF’s benefit as women on the front lines tapped into the Western perception of female fragility (Taylor 1999). Not only in this poster, but a wide array of propaganda distributed by the NLF illustrated women as at once beautiful and powerful force to be reckoned with. Common activities shown include women working in rice paddies and fighting with guns on the front lines. Additional symbols that are often incorporated are lotus flowers, conical hats, and long flowing hair. This demonstrates a continuing theme of balancing beauty with bravery and the role of women in war. While there were some cases of women being classified with children as vulnerable followers of “Uncle Ho Chi Min,” a substantial amount of the content spoke of a more active role that women played. 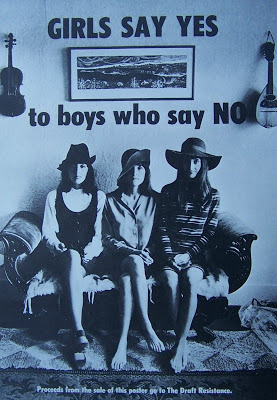 Larry Gates, Girls Say Yes to Boys Who Say No, Poster, 1968. Such feminism promoted in NLF propaganda illuminates a stark difference to that released by the United States. While women in many NLF posters are portrayed as doing substantial work, often strenuous labor, the absence of women in American military propaganda is longstanding. The fact that approximately 11,000 American women were stationed in Vietnam, serving in a variety of job roles, often goes unappreciated by people commemorating the war’s history. Instead of showing strong women working as air traffic controllers, nurses, etc., the few pieces of circulating American propaganda tended to portray women merely acting as pawns used by both pro-war and anti-war activists. Whether it was being broadcasted that women were waiting at home longingly for their men to return or that girls were less attracted to those participating, the idea that they could play a larger role was almost entirely neglected. History.com Staff. “Women in the Vietnam War.” History.com. 2011. Accessed August 9, 2017. http://www.history.com/topics/vietnam-war/women-in-the-vietnam-war . Taylor, Sandra C. “Vietnamese Women at War.” University Press of Kansas. Accessed August 8, 2017. https://kansaspress.ku.edu/978-0-7006-1256-7.html . “Vietnamese Women.” Saigoneer. May 8, 2015. Accessed August 9, 2017. “Vivid propaganda posters of ’50-’70s Vietnam.” CNN. June 15, 2017. http://www.cnn.com/travel/article/cnngo-travel-vietnam-propaganda-poster-art/index.html. The image of the girls who stand up to the fight is really impressive and is the premise of the woman’s strength, it brings a lot of inspiration to many poets and film makers to be able to Recreate these images to the public. During the 1930s, the nation fell into the worst economic condition ever faced. What began as a recession soon plummeted when Wall Street crashed on October 29, 1929. The effects of the declining economy were felt everywhere and marked a decade of high unemployment, poverty, low profits, plunging farm incomes, and lost opportunities for economic growth and personal advancement. Some of the greatest artistic depictions of this turbulent time period were Reginald Marsh’s paintings.